Some years ago, a few friends took me on a hike in the Cascade Mountains on my birthday weekend, which happens to be in October. We had a lovely fall hike up to a set of waterfalls. On the way back down, I noticed my friends were stopping and veering off the trail. Suddenly I heard “Aha, now we’re talking”. Unbeknownst to me, my friends had been planning a little surprise for my birthday. They were secretly hunting for chanterelle mushrooms in the duff under the canopies of the many giant fir and cedar trees along the trail. When they had enough, we stopped at a picnic area where I was treated to chanterelles sautéed in garlic and butter on a small camp stove. 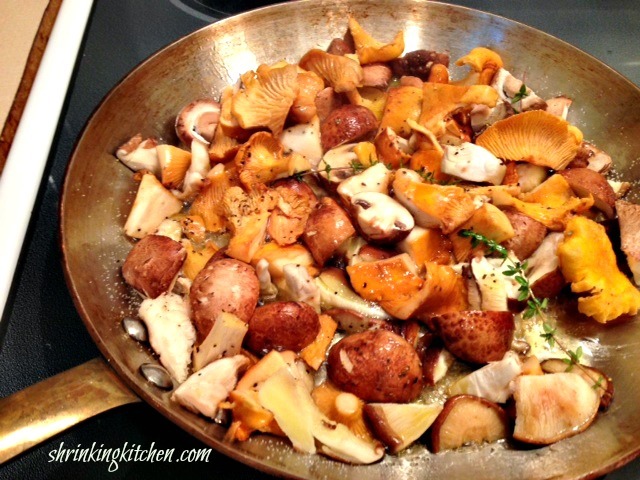 I have been hooked on wild mushrooms ever since! They were so delicious and fresh, what a revelation. 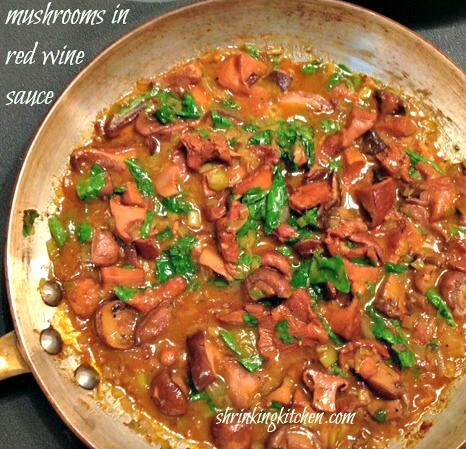 This recipe comes from an article I read from Alex Guarnaschelli where she described how she likes to cook mushrooms in red wine. I have been playing with my own version using different mushrooms and vegetables. It is really silky and savory and a wonderful side dish. It can also be used as a vegetarian main dish served over brown basmati rice or quinoa. The woods are teeming with wild mushrooms right now, and expert mushroom hunters are hard at work harvesting chanterelles, oyster, and shitake mushrooms. You will easily find them in your local grocery stores, so go ahead and try a new way to present cooked mushrooms to your family. Another option is buying dried mushrooms which are less expensive, and rehydrate before you start the dish. Serving the mushrooms warm over rice or as a side with beef or pork is a wonderful cozy fall meal that satisfies. It is lovely paired with a nice, dry red wine. Heat 1 tablespoon of olive oil in a deep skillet and add the leeks and garlic. Cook over medium heat until leeks are softened. Remove the leeks and garlic to a small bowl and set aside. 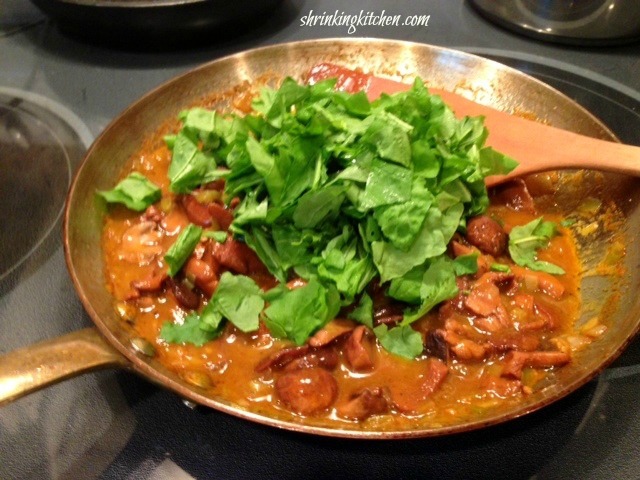 Add 2 tablespoons of olive oil to the skillet and add the chopped mix of mushrooms and thyme sprigs. Cook mushrooms over medium heat until tender and browned, about 8 minutes. Add the red wine and cook down until it has evaporated. Add cooked leeks and garlic back into the skillet. Stir in the vegetable broth, lemon juice and cook about 4 minutes until the sauce is heated through. Stir in the Marsala and cook for 1 minute. Just before serving add in the butter and baby spinach. Cook until spinach and has begun to wilt and reduce. Editors Note: Please do not go mushroom hunting unless you really know what you’re doing, or you’re with a seasoned mushroom hunter! Many mushrooms are HIGHLY POISONOUS. PLEASE remind people not to pick wild mushrooms – some varieties can be deadly. Recipe looks delicious though!